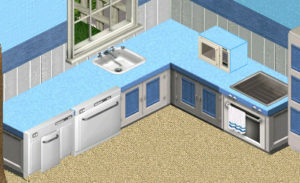 White Appliances | Dishwasher and trash compactor done to match the Cape Crab theme. Trash compactor graphics by Raveena. Stove by Fairywitch and Microwave & Fridge by LilacSims.